Tag line: "You must see it twice!" 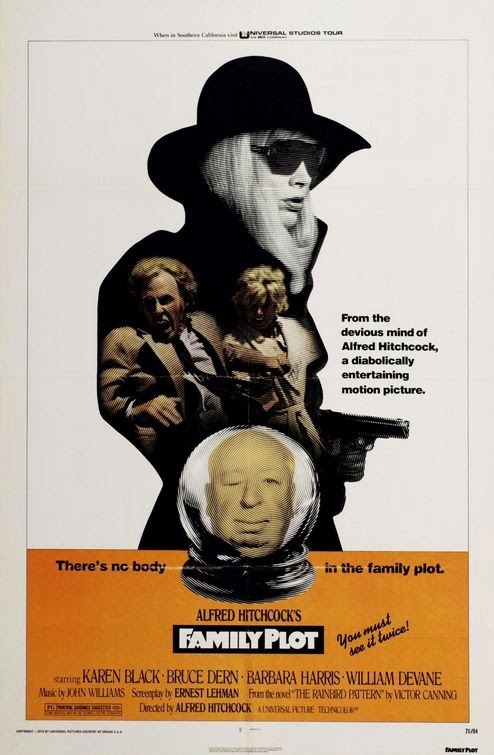 Aside from being the last movie Alfred Hitchcock ever directed, Family Plot, which hit theater screens in 1976, also marked the filmmaker’s 50th year behind the camera (his first feature-length effort, The Pleasure Garden, premiered in London on March 1, 1926). A breezy comedy/thriller with an exceptional cast, Family Plot may not be the best film Hitchcock ever helmed, but it’s a damn good one to go out on. Masquerading as a psychic, Blanche Tyler (Barbara Harris) discovers that her client Julia Rainbird (Cathleen Nesbitt), a wealthy old lady she’s been bilking for some time, has an heir. It seems that, decades earlier, Ms. Rainbird forced her sister to give up her infant son (who was illegitimate) for adoption. Now in the twilight of her years, the old girl, who has no children of her own, wants to find her nephew so that she can bequeath her fortune to him. In exchange for tracking down this long-lost member of the Rainbird clan, Ms. Rainbird promises Blanche a $10,000 reward. So, with the help of her taxi driver boyfriend, George (Bruce Dern), Blanche sets to work looking for Ms. Rainbird’s elusive heir. Meanwhile, in another part of town, kidnapper Arthur Adamson (William Devane) and his girlfriend Fran (Karen Black) are exchanging their most recent victim, shipping magnate Constantine (Nicholas Colasanto), for an enormous diamond worth tens of thousands of dollars. Hoping for one more big payday, the two set their sights on abducting a local religious leader (William Prince), but a visit from Arthur’s old “friend”, Joe Maloney (Ed Lauter), who has some disturbing news related to Arthur’s past, threatens to end their caper before it has a chance to begin. How do these two stories connect? Well, I’m not going to tell you. But then I don’t really have to, because Hitchcock himself reveals the connection early on in Family Plot (and even before he did so, I was able to figure it out for myself). Not to worry, though: this particular “spoiler” won’t affect your enjoyment of the movie in any way, shape, or form. In fact, part of the fun of Family Plot is watching Blanche and George try to fill in the blanks for themselves. Despite their somewhat shady personalities (they are, after all, a pair of con artists), Blanche and George are the film’s central characters, the “heroes”, for want of a better term, of the story, and we root for the two lovers every step of the way. Harris and Dern do a fine job bringing this entertaining couple to life, with the straight-laced George balancing out Blanche’s’ eccentric, off-the-wall soothsayer, yet the film’s most fascinating character is Arthur Adamson, wonderfully played by Devane, whose oily charm is second to none. While Frenzy is without a doubt the best of Hitchcock’s later efforts, Family Plot is an enjoyable movie in its own right, with dark humor and a number of exciting sequences to keep us poised on the edge of our seat (one scene in particular, featuring an out-of-control car on a winding mountain road, is positively nerve-wracking). With thrills and laughs aplenty, Family Plot is as good a way as any to wrap up a legendary career. I really like this movie. As you say, not his best, but a great way to go out. My favorite moments are 1) early on, when Dern and Harris are stopped at a red light and the woman crosses in front of them, and the camera simply follows her and abandons them. What a wonderfully audacious and witty moment -- classic Hitchcock. The other, of course, is the final shot -- the wink. What a great farewell. I really liked this movie, and haven't seen it in years. Thanks for the reminder! Yes, may not be his greatest, but still one of my favorites. Great story and well played out. Good cast, Dern and the recenly deceased Harris were a great match.